Perhaps one of the most tedious parts of meeting new people is finding common interests. But Koenigsegg is the bearer of good news this week, because you and roughly 7.5 billion other people now have something to bond over: your lack of a 1,600-horsepower, $3 million Jesko, which is officially sold out. That’s because, dear reader, while you were debating whether to put your spare change toward a ninth vacation home, a car you’ll barely drive, or an actually worthy cause, others were taking action and buying the Jesko. Procrastinating never won anyone a limited-production supercar. You ought to learn that. Koenigsegg, which calls the Jesko a “megacar,” announced Tuesday that it sold out just two weeks after it debuted at the Geneva Motor Show. The press release said Koenigsegg has down payments from dealers and customers for all 125 cars that will be built, but only a fraction of those came after the Geneva showing—Koenigsegg said 83 models, or about two-thirds of build slots, were sold before. The rest, the company said, came within five days of the debut. There’s still hope for a few of the folks who don’t have their name on a Jesko yet, though. The dealer slots are for “potential clients who could not attend the Geneva show,” and the company said those people should contact their dealer—unless you’ve already bought that ninth vacation home and don’t have the room to splurge this month, of course. Reports are that the Jesko will cost around $3 million, and Koenigsegg said production begins at the end of 2020—which is somehow next year, despite all of our best efforts to pretend that it’s still the mid 2000s. The company plans to build one per week once production starts. 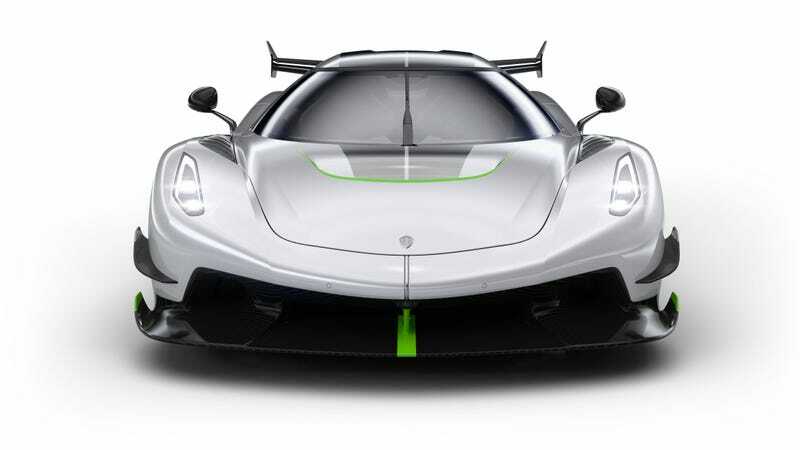 Koenigsegg’s idea is for the Jesko to be a track car that’s also street legal, with a 5.0-liter, twin-turbocharged V8 engine that makes a claimed 1,280 HP on plain gasoline, 1,600 HP on E85 biofuel, and revs to 8,500 rpm. All of that power goes through a nine-speed transmission with seven clutches, which Koenigsegg CEO and founder Christian von Koenigsegg calls “very simple” in many ways, possibly because he is from the future. But, of course, none of that matters. You already missed out thanks to that little internal debate of yours, but that’s alright. You can be sad about it in your new, ninth vacation home—or your eighth, or seventh, or just your main residence. If only you could’ve had a spare $6 million to toss out this month.